I'm pretty sure this Willys station wagon is a '56, based on the helpful info at the CJ-3B page, which states that the three-bar grille with the middle bar close to the top was used only in that year. Even if it's not a '56, it's almost certainly from the 1950s, so I'm at least close. Willys experts, now is your moment to shine! Tell us what you know about this fine vehicle. Whatever the year, this is a seriously cool machine. I've been seeing this thing around town since I was a kid, so it's an Alameda institution by now. 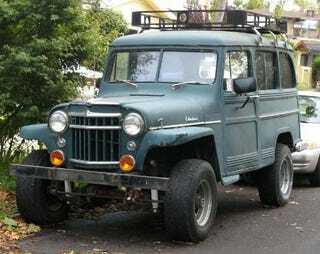 And, just in case you couldn't tell, Willys wants you to know that it's got four wheel drive. From a distance, I though this thing might be a Land Cruiser/Rover, but up close it was clear this truck didn't come from Japan or England. Seems like there should be winch in this picture, or at least a dead deer lashed onto a fender. While Alameda is pretty urban (population density higher than San Francisco's), you still see a fair number of head-to-the-hills type vehicles parked on the streets. You know, for when civilization collapses and all.